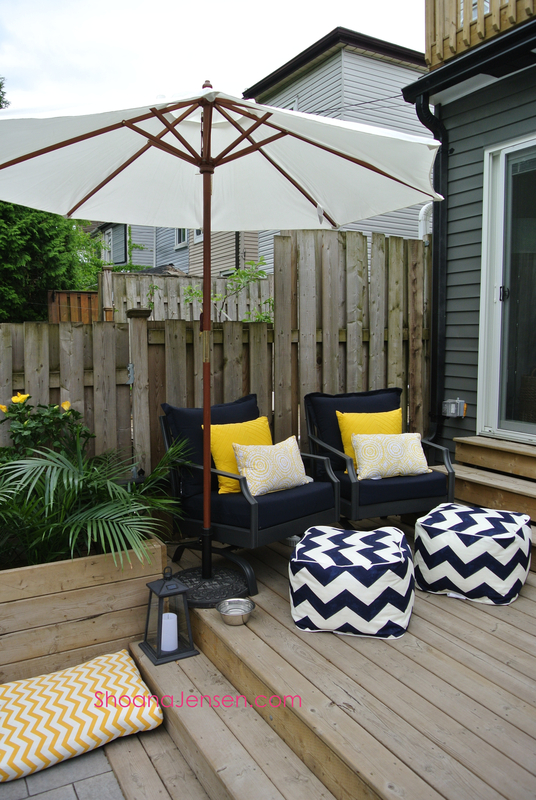 Backyard Makeover – All Done! Okay, I showed you the before & during and now it’s time for the big reveal. 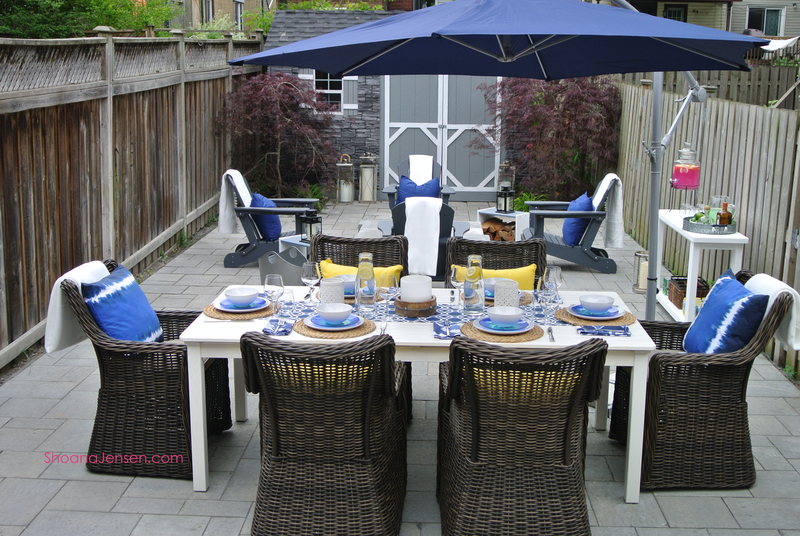 We are so happy with our backyard and have already hosted many friends and family get-togethers here. The original deck was such an awkward size, so shortening it was definitely the right idea. 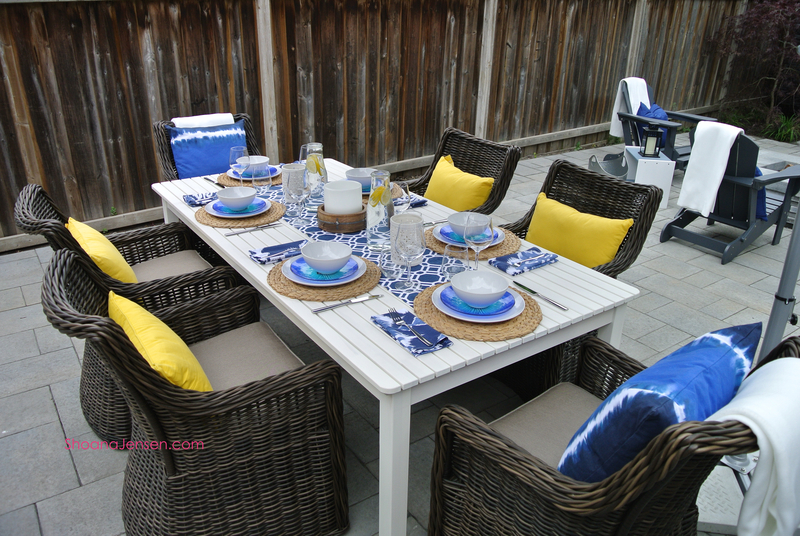 Not only did it free up more space for our dining area, but it provided the perfect place for my hubby and I to enjoy a morning coffee or a glass of wine, while barbecuing dinner. The BBQ is right across from the chairs – you just can’t see it in the picture. The classic combo of navy, yellow & white just screams summer to me. So, light, airy and fresh. Here is our dining area. I love the look of a big table. It is so inviting. We have already spent many hours sitting at this table chatting with friends and family. I just couldn’t find a reasonably priced sideboard or bar. My solution, was to use an indoor furniture piece from Ikea and paint it using Benjamin Moore Arborcoat Premium Exterior Stain, which provides great protection from the elements. 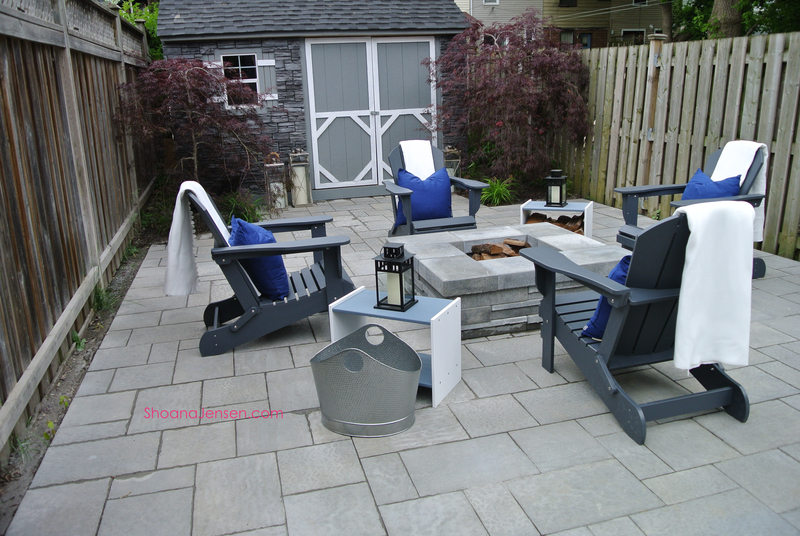 The fire pit creates a great conversation, reading and sunning area. We use this area so much more that I would have expected. The Adirondack chairs are crazy comfortable. Not only are they made in Canada they are also made from recycled heavy plastic. Plus, they fold up for easy storage. 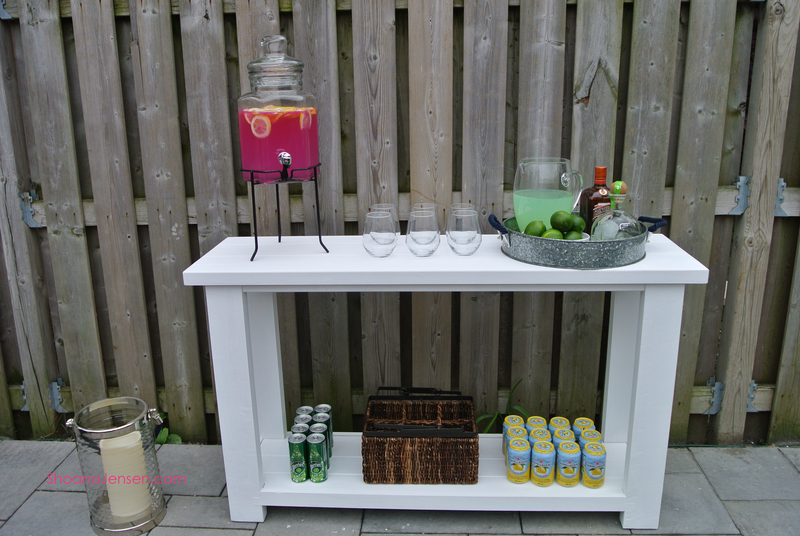 The two small side tables are also indoor Ikea tables that I painted with the same Benjamin Moore exterior stain product used on the sideboard/bar. The shed is fantastic! 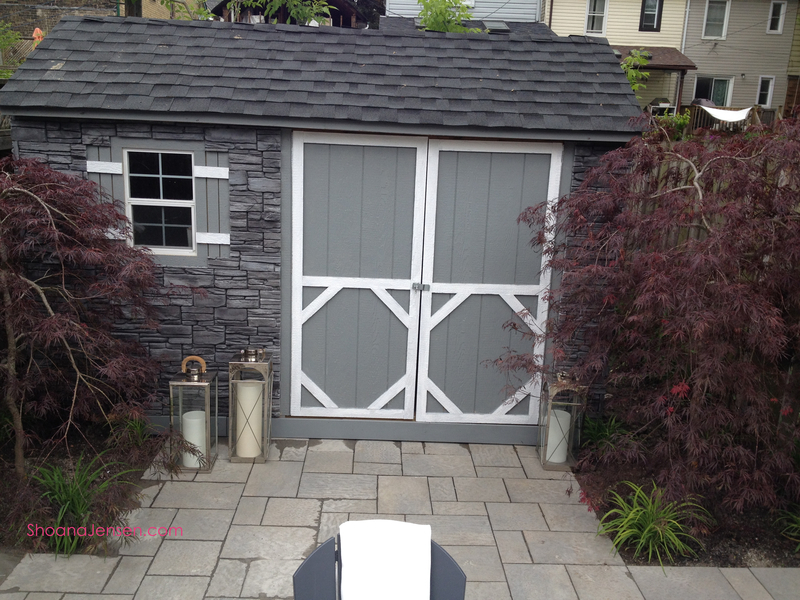 With a little creativity, you can give your big box store shed a custom look. I love it and I think it bookends the backyard perfectly. It also helps to create some privacy. Many thanks to my buddy Carson Arthur for his vision, planning and coordination of all the resources and expertise that came together to give such a great oasis in the city. I know that thee will be questions about where I bought stuff so here is the list for those who want to know. If I missed anything don’t hesitate to ask, I am always happy to share!